Washington(PTI): NASA has approved a second extension of the Dawn mission at Ceres, allowing the spacecraft to get a closer look at the largest object in the asteroid belt between Mars and Jupiter. During this extension, the spacecraft will descend to lower altitudes than ever before at the dwarf planet, which it has been orbiting since March 2015. The spacecraft will continue at Ceres for the remainder of its science investigation and will remain in a stable orbit indefinitely after its fuel runs out. The Dawn flight team is studying ways to manoeuvre the spacecraft into a new elliptical orbit, which may take the it to less than 200 kilometres from the surface of Ceres at closest approach. Previously, Dawn’s lowest altitude was 385 kilometres. A priority of the second Ceres mission extension is collecting data with Dawn’s gamma ray and neutron spectrometer, which measures the number and energy of gamma rays and neutrons. This information is important for understanding the composition of Ceres’ uppermost layer and how much ice it contains. The spacecraft also will take visible-light images of Ceres’ surface geology with its camera, as well as measurements of Ceres mineralogy with its visible and infrared mapping spectrometer. The extended mission at Ceres additionally allows Dawn to be in orbit while the dwarf planet goes through perihelion, its closest approach to the Sun, which will occur in April 2018. At closer proximity to the Sun, more ice on Ceres’ surface may turn to water vapour, which may in turn contribute to the weak transient atmosphere detected by the European Space Agency’s Herschel Space Observatory before Dawn’s arrival. 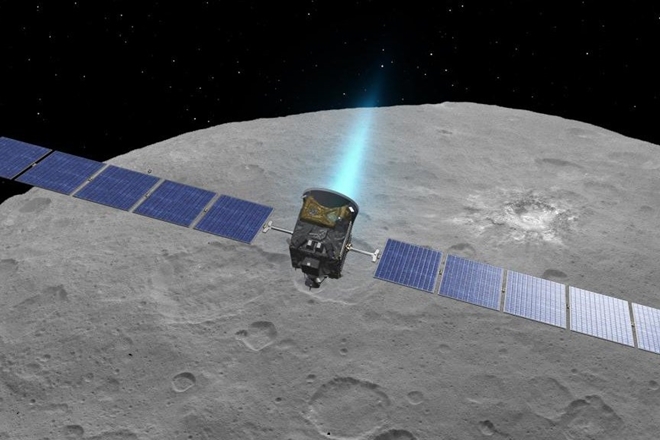 Building on Dawn’s findings, researchers have hypothesised that water vapour may be produced in part from energetic particles from the Sun interacting with ice in Ceres’ shallow surface. Scientists will combine data from ground-based observatories with Dawn’s observations to further study these phenomena as Ceres approaches perihelion. Instead, it will carry out as much science as it can in its final planned orbit, where it will stay even after it can no longer communicate with Earth. Mission planners estimate the spacecraft can continue operating until the second half of 2018.
largest object in the asteroid belt between Mars and Jupiter.